If you snore and are worried about sleep apnea, to get a diagnosis you’ll need to undergo polysomnography in a sleep study. 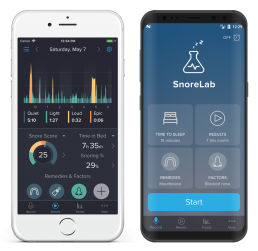 At SnoreLab, we often get asked “Can the app detect sleep apnea?” Some users have found tell-tale signs of sleep apnea in their SnoreLab recordings, but importantly, these don’t reliably tell you that you have sleep apnea. The only way to robustly diagnose sleep apnea is with a sleep study. Some estimates put the rate of sleep apnea amongst people aged 30-60 at 16.5%, but the vast majority of these people are undiagnosed . This is because there is a lot of anxiety, unawareness and misinformation surrounding sleep studies. This article aims to demystify sleep studies so you know what to expect if you want to make a positive step towards understanding and treating sleep apnea. What does a sleep study do? A sleep study does exactly what the name suggests, it studies your sleep. This is done via a process called polysomnography (PSG) which literally translates to “many sleep measurements”. Blood oxygen levels – blood oxygen drops during apneic episodes. 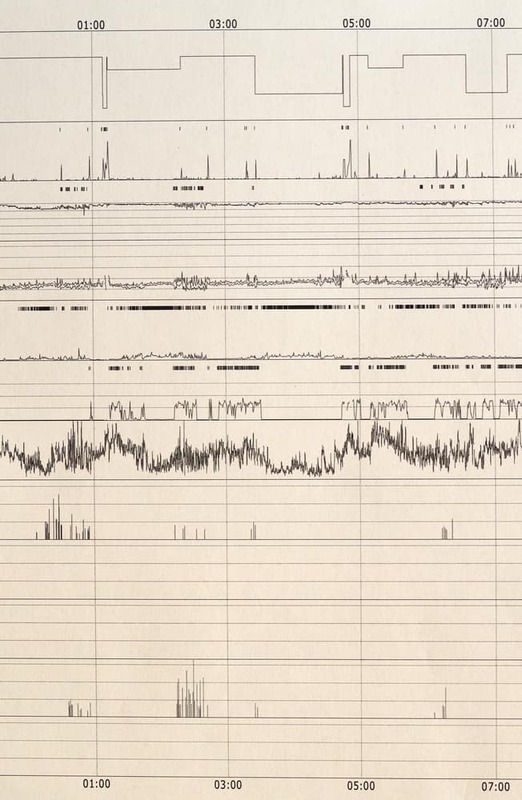 Brain activity – to detect the microarousals that accompany apneic events and assess sleep stage. Breathing rate and effort – to provide evidence of breathing interruptions. Eye movement – helps to determine what stage of sleep you are in. Sleeping position – gives some insight into what triggers sleep apnea. PSG can also be used to study other conditions such as narcolepsy, restless leg syndrome, periodic limb movement disorder, insomnia, sleepwalking and night terrors. How do I get a sleep study? If you think you might have sleep apnea, first assess your risk with some questionnaires. Scoring high on screening questionnaires such as the STOP-Bang questionnaire and the Epworth Sleepiness Scale can be useful in persuading clinicians that a sleep study is necessary. You can then see your doctor to request further investigation into your sleep breathing problems. As well as your screening questionnaire results, SnoreLab can often be very helpful in giving your doctor some evidence of your loud snoring or maybe even some apneic episodes. If seeing a general practitioner for your initial consultation, you may first be referred to a sleep specialist or an ear, nose and throat (ENT) clinician before being offered a sleep study. In some countries, there are online companies that conduct home sleep studies without you ever having to attend a medical consultation. After filling out an online assessment form and paying a fee, these companies will post your study equipment to you with instructions. Which type of study is best for me? If your specialist deems you to be at risk of sleep apnea, you should be offered a sleep study to confirm this suspicion. There are two types of study, one done at a specialist sleep lab, the other in your home. Often, your specialist will recommend the most suitable type of study for you and will make you aware of the relative merits of each. Sleep studies conducted at specialist labs are more comfortable than many people think. The word “lab” conjures images of cold indifference; people in white coats and unfriendly, clinical surroundings. Most bedrooms in specialist sleep clinics are comfortable and sympathetically decorated, with a real bed as opposed to a hospital trolley – some say akin to a three-star hotel. Maintain a normal and healthy sleep routine on the nights leading up to the study. Limit caffeine consumption and avoid alcohol altogether. You may also need to adjust your medications (ask the referring specialist beforehand). Something to keep you occupied before going to sleep. There will likely be a period of winding down before the study starts, so a book or puzzle to keep you occupied (without excessive stimulation) is a good idea. Any medication you take routinely, both to maintain that routine and to show to the staff, as this can provide some insight into your sleep symptoms. Because PSG measures many different things, there are lots of attachments that need to be made. Ultimately, you need to be relaxed enough to sleep properly, so the technician should take time to make sure the attachments are secure yet comfortable. This will take anywhere from thirty minutes to an hour, so you should use this time to ask any questions you have. Head – electrodes taped on to measure your brain activity. Side of your eyes – these measure the movement of your eyes to help determine your sleep stage. Chin – electrodes here assess the muscular tension in your jaw. Nose – a nasal cannula rests two small tubes into your nostrils to measure breathing rate. Chest – a strap here monitors your breathing effort. This part may also include a small box where other channels are connected to. Finger – a small clamp usually on your index finger measures blood oxygen levels by shining infra-red light through your finger nail. Once all of these attachments are in place, your technician may ask you to blink or make some snoring noises to test the connections. You are likely to then be given some time to wind down before going to sleep. Depending on the time of your study and the individual practices of different labs, you may be provided with a meal. As more and more pieces of wire are attached to you, you’ll probably feel that it’s less and less likely that you’re going to be able to sleep in this strange environment. People often start to worry that they won’t sleep or get accurate results. In reality, only a tiny proportion of sleep tests fail due to inadequate sleep data. It may take a little longer to fall asleep, but usually, you’ll get plenty of sleep which will give the clinicians lots of data to work with. Typically, you are given six to seven hours to sleep. A technician will monitor you overnight. If you need to urinate in the middle of the night, simply let the technician know and they will come to disconnect the relevant attachments properly. Don’t be surprised if you wake up to a different technician. Sleep studies last about ten hours from initial arrival so it’s likely that the staff will change over. Once you have been given time to change and freshen up, you might be asked to complete some questionnaires about your sleep and symptoms. Everything is usually done by 7am. Typically, you will have your home sleep study about four weeks after your initial referral. Get the main components attached by a technician with just a few connections for you to do once home before you go to sleep. Having a specialist fit the components allows use of more connections giving more measurements. If you have mobility issues, it may be possible for a sleep technician to deliver and fit the study equipment in your home. Nasal cannula – rests two small tubes in your nostrils to assess your airflow. Finger clamp – this is a pulse oximeter: a device that measures the amount of oxygen in your blood. Chest strap – this measures your breathing efforts as well as containing a box where the other wires connect. This is the minimum. 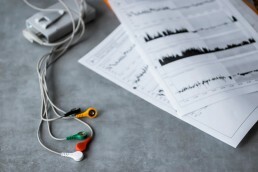 Some home studies, particularly those where a specialist gets you fitted at the clinic beforehand, have more attachments that can also measure brain, eye and muscular activity; much like a lab study. Once wired up, despite being in the comfort of your own bed, you are likely to take a little longer to get to sleep. Most people report that the attachments feel a little strange but not uncomfortable. The set-up should allow you to sleep in whatever position you like. If you worry that you aren’t sleeping enough, remember that only a tiny handful of sleep studies fail due to inadequate sleep data. Though you may feel you haven’t slept particularly well, chances are, you slept much more than you think you did. Most equipment is quite easy to disconnect. Clinics don’t usually require the parts to be bundled up neatly and often supply a simple plastic bag or box for you to simply stuff the parts into. Usually, the cannula is disposable. Some units will have a little light that shines either green or red in the morning to indicate whether the test has sufficient data. You’ll be given instructions before as to what to do if the light is red. You then need to return the study to the clinic for them to generate the results. To better understand what happens in a home sleep study, read Susan’s story, a SnoreLab user’s first-hand account of getting a sleep apnea diagnosis through a home sleep study. Getting your sleep study results back can take days to weeks. If you have had a home study and your results are unclear, your specialist may refer you for a lab study instead. This is a summary of the findings. They will say whether your sleep and the data obtained was adequate as well as an overview of the findings including: sleep position, sleep stages and apneic episodes. Total AHI – the average number of times per hour, you experienced an apneic or hypopneic event (total or >50% breathing cessation for 10 seconds or more). NREM AHI – the AHI during the non-REM stage of sleep. REM AHI – the AHI during the REM stage of sleep. Minimum oxygen saturation – the lowest level of oxygen detected in your blood. Longest apnea – the duration in seconds of your longest period of complete breathing cessation. Longest hypopnea – the duration in seconds of your longest period of partial (>50%) breathing restriction. Mean apnea/hypopnea duration – the average time in seconds of each episode. Arousal index – the number of times per hour you aroused from sleep. Normal: AHI = 0-5. This will sometimes just be called “primary snoring”. Time available for sleep – i.e. when the lights were off. Sleep in supine position – time spent sleeping on your back. You can learn more about the different sleep stages with SnoreLab’s insights into the Architecture of Sleep. Your results report may also include some recommendations. If your results show little to worry about (i.e. normal primary snoring) you’ll get some general advice that takes into account both the study results and your general health. If sleep apnea has been detected and you had your study through a referral process, you will then have some follow up appointments to discuss treatment options. Mild to moderate sleep apnea can often be improved with consumer anti-snoring remedies and positive lifestyle changes. Usually, severe sleep apnea requires treatment with CPAP. See SnoreLab’s guides to the different types of CPAP mask and how to fix common problems with CPAP. This article gives an overview of the general processes in most laboratory and home sleep studies. Individual practices may vary.